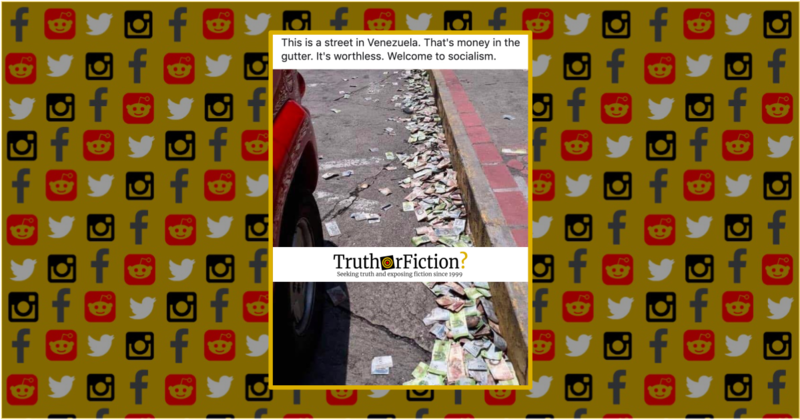 Does an Image Show 'Worthless' Money in the Gutter in Venezuela? - Truth or Fiction? A viral Facebook post claims that a photograph shows worthless currency abandoned in the street in Venezuela. Photograph shows worthless currency abandoned in a Venezuela street gutter. This is a street in Venezuela. That’s money in the gutter. It’s worthless. Welcome to socialism. Although the image lacked any corroborating information (such as location, date, or news links), it was extremely popular. News stories published prior to the images’ circulation reported that Venezuelans increasingly relied on debit cards due to hyperinflation, and in 2016, a New York Times correspondent in Venezuela described using of massive quantities of cash for the same reasons. A bank was looted in Venezuela, and then the people burned the money to show it was worthless. Saquearon el banco bicentenario que está subiendo por la avenida 3 arriba de glorias patrias y querían saquear los árabes, en Merida. On August 20, 2018, the bolivar fort (bolívar fuerte) is replaced by the sovereign bolivar (bolívar soberano) at the rate of 1 sovereign bolivar per 100,000 bolivars strong. The change was originally scheduled for 4 June 2018 at a rate of 1 per 1000 but was eventually postponed by President Nicolás Maduro. On Monday, March 11 , hooded individuals sacked the Bicentenario bank agency on Avenue 3, Glorias Patrias, in Merida state. That was confirmed by the deputy of the National Assembly Williams Dávila, as well as by the correspondent of El Nacional in the state of Mérida, Leonardo León. León said that after the incident, the troops arrived from the Bolivarian National Guard (GNB), State Police Mérida and CICPC [Venezuela’s national police agency]. According to a local news source, the circulating image and other related ones depicted the aftermath of a bank robbery in Mérida, Venezuela. The currency seen in the street was “old money,” largely rendered worthless due to an August 2018 change in its valuation. Although the money in the gutter was of low value, it was “old money” and was discarded as a result of a bank incident. How much the hyperinflation and ensuing mass devaluation had to do with socialism rather economic mismanagement or simple corruption is a matter of debate both on and off social media, but the images are real. This is a street in Venezuela. That's money in the gutter. It's worthless. Welcome to socialism. The Bicentenario bank in Merida was looted. The Venezuelan bolivars were left behind, strewn on the streets far in the distance and set fire to in piles, proving recent hyperinflation has made the money truly worthless.